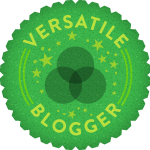 A big thank you to the beautiful Aga from Aga’s Suitcase who kindly nominated little ole’ me for the Versatile Blogger Award! I’ve only been around for 6 months or so, but excuse me while I grin sheepishly for a moment as this has been my very first award on the blog circuit so I’m gonna party like it’s 1999! Now I don’t usually do things like this but since it’s my first award I thought heck why the hell not, plus it gives me a chance to nominate some of my favorite and regular bloggers out there too. Find my nominees below and make sure you check them out. I studied Interior Design, am a compulsive recycler and potato crisps are my weakness. I am an avid animal lover however my love for chicken is holding me back from becoming a true vegetarian. In a past life I was grooving away at Woodstock and when I approach large bodies of water I have a mild compulsion to jump into them!